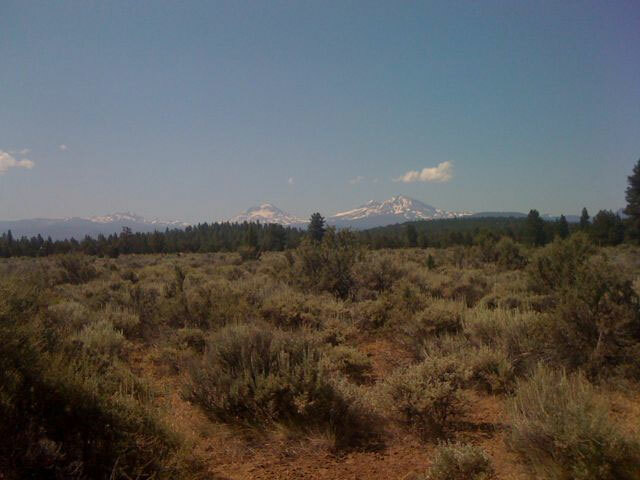 I am out here with my family in beautiful Bend, Oregon racing the Cascade Cycling Classic. The field here is like a “who’s who” of whose not in the Tour de France. To give you an example, during one of the many “slam on your brakes” moments in Stage 2, I almost rear-ended Oscar Sevilla and Tom Zirbel. Freddie Rodriguez won the field sprint yesterday edging out Taylor Phinney, but there was a break of 18 up the road including Victor Hugo Pena, Rory Sutherland, Chris Baldwin, Darren Lil, and Ivan Dominguez. Francisco Mancebo got third in yesterday’s stage behind Ben Jacques-Maynes and Jeff Louder. Floyd Landis is here and riding well in support of his teammates (Chris Baldwin and Rory Sutherland are 3rd and 5th in the GC afer Stage 2). BMC has a strong team including Brent Bookwalter and former Postal rider Tony Cruz. Altogether, we had 184 starters for Tuesday’s road race, 177 starters for Stage 2, and 168 starters for Stage 3. This race was mostly flat with the exception of one KOM. I’ve never ridden with 180+ riders in a field before so I was surprised by how smooth it went — no crashes that I could see or hear, but there was plenty of times we had to brake hard going into corners or if a car hadn’t pulled all the way off the road — sort of like a big river that ebs and flows as the river gets wider or narrower. Part of the reason for the smoothness though was the raw speed. We started out averaging well over 30mph. This kept the large pack strung out. Mike Olheiser attacked about an hour into the race to get away to go for the KOM points. Eventually 10 other riders made it into the break with him. Several riders bridged across at different times making a very large break of 18 riders. It was just the right composition of teams so nobody with enough firepower was left to chase meaning that the break stayed away for the rest of the race gaining 4’49” on the rest of the field. We started up the KOM pretty fast (25+ mph) but then slowed down to maybe 15mph at the steepest part before accelerating to close to 25mph again across the top. The pace was fast but manageable. The hardest part of the race came a couple miles after the KOM when we headed up a long (5+ miles) false flat gaining about 500′. Garmin’s development team missed the break so they were up at the front at a very fast tempo – 28-32mph with crosswinds – that kept the pack strung out single file for miles. It was very hard because you weren’t getting much draft at all from the rider in front of you. Once they realized they weren’t going to catch the break, they turned off the gas and the break extended its lead. Everything else was relatively easy although it was very hot by the finish and staying hydrated was tough. I coasted across the line in 122nd. 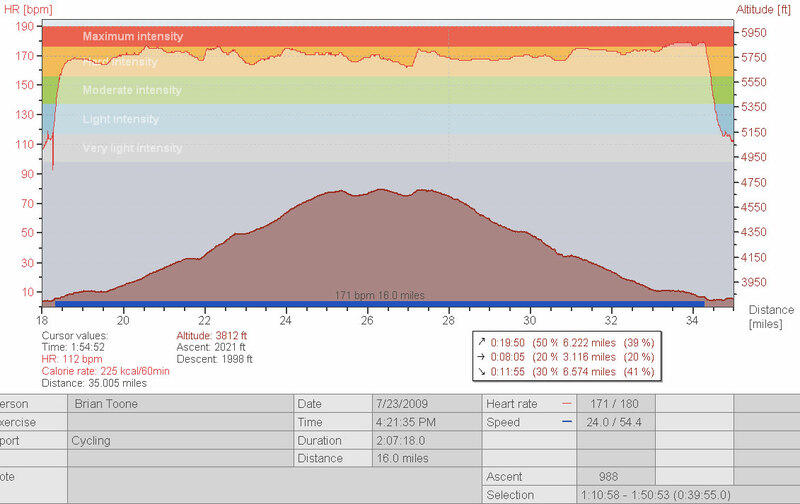 Today’s race was a bit more hilly. We started out very fast again with a gradual rolling descent for the first 30 miles. I looked down at my speedometer at one barely downhill section and we were going 43 mph, full out. The fast speed lasted all the way through the second feed zone when a split happened and the front group turned into a group of about 40 and the back group had the rest of us — about 138-140 riders by that point. I was near the split so I ended up getting into the rotation to help chase it down. Eventually everything came back together. We hit the KOM at a very manageable pace and then really slowed down for a bit to about 23-25mph. The first of two crash near-misses came when a narrow bridge slowed the pack at the front suddenly. At the sound of squealing brakes, I slammed on my brakes and still nearly rear ended Oscar Sevilla and Tom Zirbel. Shortly after the bridge as we approached the bottom of the climb, the pace really started to pick up. Then a few riders got tangled up and went down right at the base of the climb right in front of me. I skidded to a stop just barely before hitting them, but the damage was done as the main field sped away at close to 30mph while a bunch of us towards the back were still getting clipped back into our pedals and around the crash. I worked with about 5 riders to catch and pass another group and we had the main field in our sights about 30 seconds ahead, but the pace eventually got to me and I got dropped from that group and started surfing different groups … sometimes able to stay with them and pass people from groups ahead and sometimes falling off again to the next group. I finished 108th 7’35” back from Oscar Sevilla who ended up winning the stage and taking over 1st on GC. It was a very disappointing TT for me today as I missed the timecut by 37 seconds. It’s small consolation but so did 13 other riders including Freddie Rodrigues from Rock Racing. The long climb on the course was a real power climb averaging 3% gradient, which also meant the descent was a power descent where aero equipment was hugely advantageous. All I had was my tt bars and I just could never get up to speed on the way up or the way down. 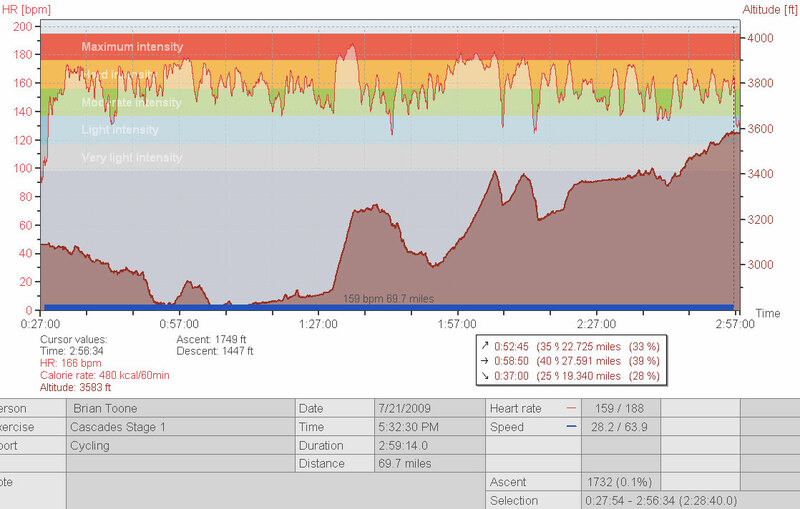 I was surprised because my legs felt OK during my warmup run on the course, but they were just dead during the race. I got passed by 4 or 5 people starting at 30 second intervals. Not a very impressive performance, but I am hoping to rest up and have fresher legs for Elk Grove in Chicago next weekend. 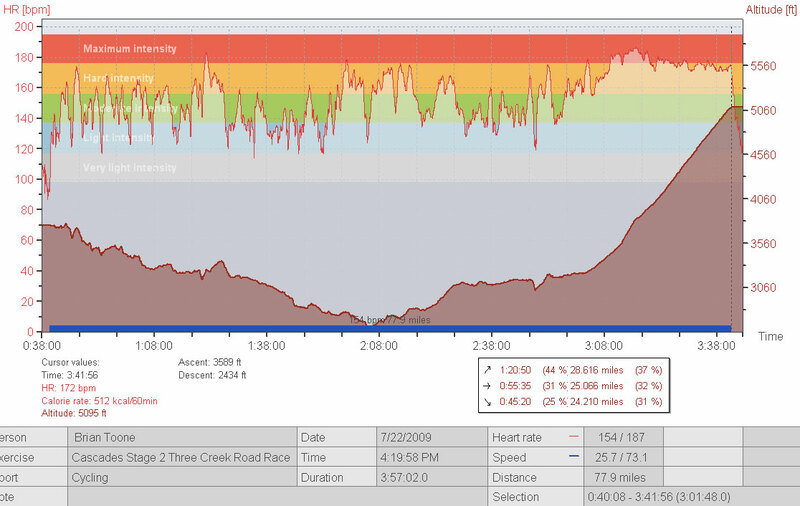 This entry was posted in Racing and tagged heartrate, photos, road race, time trial on July 23, 2009 by kartoone.